Yudo Inc bring us another music app for the iPhone and iPod touch called Aero Synth. Aero Synth is a musical and rhythmical game that is downloadable in the app store for $2.99. Just like DDR, Guitar hero, and Lumines, your goal of the game is to connect the icons while following the beat. Aero Synth contains a lot of different types of music including tracks from a very popular Korean Mmorpg Cabal online as well as many other DJs. The music is clear, and with headphones, the bass is amazing. 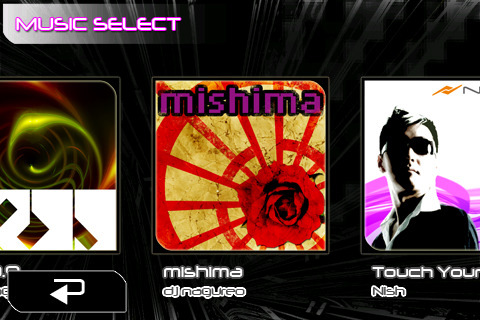 You can also play in a freestyle mode where you can enjoy selected tracks that have been previously unlocked. The gameplay is very easy to understand but certainly very difficult to master. In freestyle mode you can select up to three different difficulties, but to play new songs in freestyle mode, they must be unlocked by playing expert mode first. 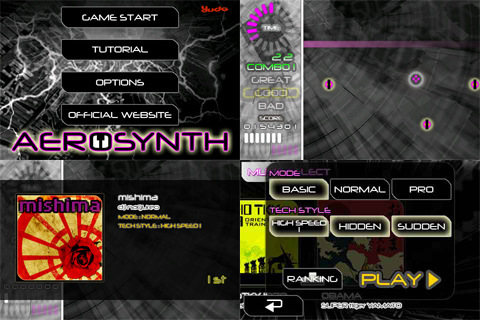 In expert mode, you play stages that contain three tracks. Each track has a special stipulation and you have to beat them while dealing with special obstacles. One of the things I wished Yudo would have done is adding a feature where we can just listen to music alone. The game doesn’t contain anything special that would make it stand out. It would have been awesome if they added some goodies to be unlocked like wallpapers, skins etc. Compared to other music based games, Aero Synth doesn’t feel that unique. Yes, the music is good and the difficulty is challenging. But besides those two, there’s nothing that makes this game stand out compared to other rhythm games. Aero Synth is a fun game for awhile, but there aren’t any fun challenges that make it stand out. After an hour it just feels like a rinse and repeat game. It is a fun game to pick up and play for awhile, but it just doesn’t feel like something I’ll be playing for a long time. With a price of $2.99, it’s best to try the free version in the app store to see if it suits you. Sample the free version of Aero Synth on your iPhone. AppSafari review of Aero Synth was written by Vincent Tam on February 16th, 2011 and categorized under App Store, Games, Music. Page viewed 3418 times, 1 so far today. Need help on using these apps? Please read the Help Page.